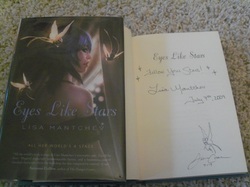 Signed, lined (with a quote from the book) and dated by the author. 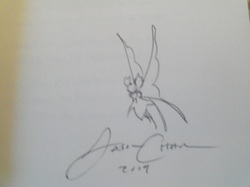 Also hand-illustrated by Jason Chan, who has drawn a sketch of a fairy. This is a first edition, second impression copy - some mild bumping from its transatlantic journey, but is nonetheless an exceptional rarity. Synopsis - Beatrice Shakespeare Smith, a sarcastic, likable 17-year-old, must find a way to make herself invaluable to the Théâtre Illuminata or she will be forced to leave the only home she has ever known. How she arrived at the theater as a baby is somewhat of a mystery, and through the years she has been allowed to run free and cause mayhem of one kind or another. Beatrice proposes to re-stage Hamlet set in ancient Egypt and promises it will be the sell-out performance that will restore the Théâtre to its former glory. If that were all, the story line would be fairly straightforward. However, the Théâtre Illuminata is no ordinary theater. Characters from the world's major plays live inside, summoned forth by pinning a note on the Call Board. They are bound to the physical confines of the theater by the pages in The Complete Works of the Stage, an enchanted book. Scene changes happen magically by command, though human Properties and Scenic Managers argue over which pieces belong to whom. The fairies from A Midsummer Night's Dream provide the comic relief, and Ariel and Ophelia provide some of the action. 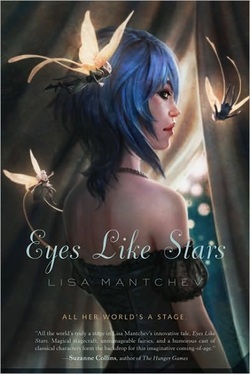 Readers who have some knowledge of or interest in theatrical productions will have the easiest time following the twists and turns of the plot, wondering what crazy thing will happen next will keep them going.